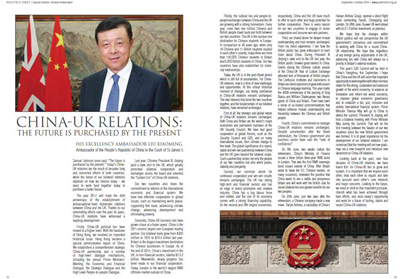 The Politics First Magazine Published A Signed Article by Ambassador Liu Xiaoming Entitled "China-UK Relations:The Future Is Purchased by the Present"
Samuel Johnson once said, "The future is purchased by the present." Today's China-UK relations are the result of decades long and concerted efforts of both countries, while the future of our bilateral relations depends on how we choose today – we need to work hard together today to purchase a better future. The year 2017 will mark the 45th anniversary of the establishment of ambassadorial-level diplomatic relations between China and the UK. Thanks to our unremitting efforts over the past 45 years, China-UK relations have witnessed leapfrog development. Firstly, China-UK political ties have moved to a higher level. With the handover of Hong Kong, we resolved an important historical issue. Hong Kong became a special administrative region of China. We established a comprehensive strategic China-UK partnership and a number of high-level dialogue mechanisms, including the annual Prime Ministers' Meeting, the Economic and Financial Dialogue, the Strategic dialogue and the High Level People-to-people Dialogue. Last year, Chinese President Xi Jinping paid a state visit to the UK, which greatly promoted bilateral cooperation and exchanges across the board and unveiled the "Golden Era" of China-UK relations. Our two countries also share the commitment to reforms of the international economic and financial system. We have had effective cooperation in global issues, such as maintaining world peace, supporting free trade, addressing climate change, advancing development and eliminating poverty. Secondly, China-UK business ties have grown closer at a faster speed. China is the UK's second largest non-European trading partner. Our bilateral trade grew from ＄300 million in 1972 to ＄78.5 billion last year. Britain is the largest investment destination for Chinese businesses in Europe. As of the end of 2015, China's investment in the UK, in non-financial sectors, totalled ＄13.2 billion. Meanwhile, steady progress has been made in our financial cooperation. Today, London is the world's largest RMB offshore market outside China. Thirdly, the cultural ties and people-to-people exchanges between China and the UK are growing with a strong momentum. Every year, more than one million Chinese and British people travel back and forth between our two countries. The UK is the number one destination for Chinese students in Europe. In comparison to 40 years ago, when only 16 Chinese and 11 British students studied in each other's country, today there are more than 150,000 Chinese students in Britain and 6,000 British students in China. Our two countries have also established 55 sister-city relationships. Today, the UK is in the post-Brexit period which is still full of uncertainties. For China-UK relations, now is a time of new challenges and opportunities. At this critical historical moment of changes, our strong confidence in China-UK relations remain unchanged. The vital interests that bond the two countries together, and the fundamentals of our bilateral relations, have remained unchanged. First of all, the strategic and global nature of China-UK relations remains unchanged. Both China and Britain are the world's major economies and permanent members of the UN Security Council. We have had good cooperation at global forums, such as the Security Council and G20, and on many international issues from climate change to free trade. The global significance of a sound, stable and win-win partnership between China and the UK goes beyond the bilateral scope. Such a partnership serves not only the people of our two countries but also world peace, stability and prosperity. Second, our common desire for continued cooperation and win-win results remains unchanged. The UK has strong high-tech and financial sectors and has an edge in brand promotion and creative industry. China has a big labour force and market, and the size of its economy comes with a strong financing capability. As the second and fifth largest economies respectively, China and the UK have much to offer to each other and huge potential for further cooperation. There is every reason for our two countries to engage in closer cooperation and become win-win partners. Third, our shared desire for deeper mutual understanding and trust remains unchanged. From my direct experience, I see how the British public has great enthusiasm to learn more about China. During President Xi Jinping's state visit to the UK last year, the British public showed great interest in China. Events during the Chinese culture season of the China-UK Year of Culture Exchange attracted tens of thousands of British people. The Confucius institutes and classrooms in Britain are direct outcomes of great enthusiasm in Chinese language learning. This year marks the 400th anniversary of the passing of Tang Xianzu and William Shakespeare, two literary giants of China and Britain. There have been a series of co-hosted commemorations that helped enhance mutual understanding and friendship between the Chinese and British people. Fourth, China's commitment to stronger China-UK relations remains unchanged. Despite uncertainties after the Brexit referendum, the Chinese government and business sector have cast the "vote of confidence". On 8 June, two weeks before the referendum, China's Ministry of Finance issued a three billion three-year RMB bond in London. That was the first RMB sovereign bond issued outside of China. After Britain voted to leave the EU, Chinese leaders, on many occasions, reiterated the position that China wants to see a stable and prosperous Britain and will work with the British side for closer bilateral ties and greater benefits for our two peoples. On 25th June, just two days after the referendum, a Chinese company made a new move. Tianjin Airlines, a subsidiary of China's Hainan Airlines Group, opened a direct flight route connecting Tianjin, Chongqing and London. On 28th June, Huawei UK went ahead with its ￡1.3 billion investment as planned. We hope that the changes within British politics will not compromise the UK government's consensus and commitment to working with China for a sound China-UK relationship. We hope that, regardless of any foreign policy adjustments in the UK, advancing ties with China will always be a priority in Britain's external relations. This year's G20 Summit will be held in China's Hangzhou, this September. I hope that China and the UK will seize that important opportunity to work together with other member states for the strong, sustainable and balanced growth of the world economy, to advance an innovation and reform-led world economy, to improve global economic governance and to establish a fair, just, inclusive and orderly international financial system. Prime Minister Theresa May will go to China to attend the summit. President Xi Jinping will hold a bilateral meeting with Prime Minister May during the Summit. That will be the first meeting between the leaders of our two countries since the new British government was formed. It is of great importance for the development of our bilateral relations. I'm convinced that the meeting will set new goals, map out a new blueprint and introduce new dynamism to the future of China-UK relations. Looking back at the past, over four decades of China-UK relations, we have learnt this: for China-UK ties to grow and sustain, it is important that we respect each other, treat each other as equals and take into account each other's core interests and major concerns. Looking to the future, we need to stick to this important principle, cherish what has been achieved through hard efforts, and seize today's opportunity and work for a future of lasting, stable and sound China-UK relations. The Politics First magazine was founded in 2011. It is a renowned bimonthly magazine which provides first-rate coverage and analysis of the pressing political issues in Britain and the wider world. Its readers include government officials, members of parliament, business leaders, and legal and academic professionals.